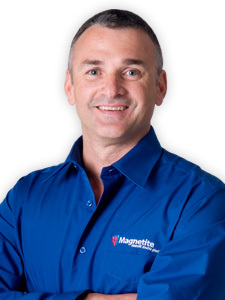 Magnetite believes that excellent service is integral to our business and our success. We are a service focused business that works with you to provide retrofit window insulation solutions to reduce noise and energy consumption within buildings. We understand it is important for our clients to receive reliable, timely and efficient service. Our knowledgeable and experienced consultants assess your needs and provide a retrofit double glazing solution that will produce immediate results. With Magnetite double glazing windows system there is no need for structural changes or replacement windows, which significantly reduces your costs. This is the affordable way to acoustically insulate and thermally enhance your building envelope. Long term value of double glazing is important and we are confident that Magnetite windows can offer this. We commit to this by offering our customers a 7 year warranty on all installations. 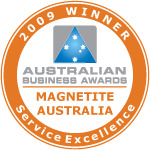 Magnetite (Australia) Pty Ltd was presented with two awards at the Australian Business Awards 2009, in the categories of Best Value Product and Service Excellence. 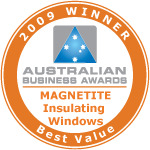 Magnetite was one of 83 Australian Business Award recipients from a total of 1588 entries across 16 categories. The Australian Business Awards are a national program honouring organisations that demonstrate the core values of business excellence, product excellence, sustainability and commercial success in their respective industries.